cated to the south west of Puri, covering a widespread area of 1100 sq kms, Chilika Wildlife Sanctuary is one of the most visited wildlife sanctuaries in Odisha. This wildlife sanctuary is home to various migratory and local birds such as Flamingo, White Bellied Sea Eagle, Brahminy Kite, Spotbilled Pelican, Barheaded Goose, Openbilled Stork, Spoonbill, Brahimny Duck, Wigeon, Pintail, Shoveller, Ibis, Stilt, Heron, Egret, Avocet, Gull, Tern and King Fisher etc. Apart from residents and migratory birds, Chilika Wildlife Sanctuary is also home to Blackbuck, Spotted Deer, Golden Jackals, Hyenas and many more. Rich in aquatic wildlife, this sanctuary houses Dolphin, Prawn, Crab, Limbless Lizard and Crustaceans. More than 225 species of fish including Acentrogobius Griseus, Alepes Djedaba, Arius and the Elops Machnata are also found here. 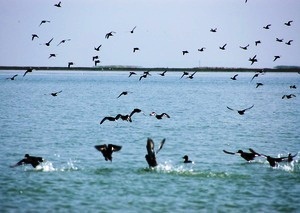 The sunrise and sunset at Chilika Wildlife Sanctuary is very popular among the tourists. Lots of people especially visit this sanctuary for this splendid view. One of the most famous tourist attractions near Chilika Wildlife Sanctuary is Kalijai Temple, devoted to Goddess Kalijai. Each fisher man visits Kalijai Temple before going on a fishing expedition at Chilka Lake. Reasonably priced boats can be hired from Balugaon and Barkul for the sanctuary.